I was half tempted to do a double BTN on both Coreys, but I decided that wouldn't be fair to either of them given that Feldman has a ton of movies left in him. 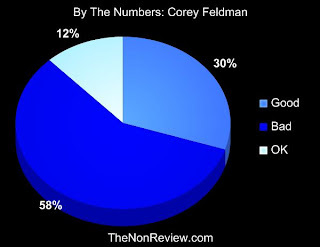 I almost let bias overtake me again this go round as I have always liked Corey Feldman, having grown up on his movies. But this is a game of numbers. It was unfortunately, inevitable. Despite the fact that I have a sense of humor that can appreciate a lot of the cult movies that others would be quick to dismiss, I couldn't ignore the enormous amount of clunkers banging around in his closet. For every Stand By Me and Goonies, there are that many more Meatballs 4s. Even the childhood favorite Teenage Mutant Ninja Turtles is cancelled out by TMNT III. None of which takes away from the excellency of the roles he's owned over the years. He's another one that might have faired differently if I ran a BTN on television. However numbers being what they are, at 58% negative over 42% positive, Corey Feldman falls well outside the good range. If there's an actor or actress you'd like to see me do a BTN on, just let me know after the beep. I would have thought the bad would have been a LOT higher. I can think of three good movies - were there more? I'd say that is just about right. Oooh poor Corey. Well, to be honest, I was a fan of his older films anyway - like after Stand By Me, I didn't really dig him as much. Should you do Renfro too? I think you should really work for the next one - Do Walken or Martin Mull or Michael McKeen ;) I feel like they've all been in hundreds of movies. i have recommended many people but you never pick mine. It's that bad?! Oh poor Corey. Oh... since you mentioned Goonies, how about Sean Astin? For Feldman's single greatest performance, scan to 5:39 in this clip!